While technology has definitely given us and our society many conveniences and advantages, it has some downsides as well. One of them is EMF, or electromagnetic field radiation. These days, anyone who makes use of technology is likely to be exposed to electromagnetic radiation at varying levels throughout their day. It is one of the most insidious (and least talked-about) negative effects of technology. Electromagnetic fields (EMF) are created by the positive ions that are discharged by our electronic devices, power lines, fluorescent lights, microwaves and other appliances. Scientists have estimated that we are exposed to about 100 million times more EMF than our grandparents were! If you sit in front of a computer for a number of hours each day or talk on your cell phone a lot, chances are you're being exposed to quite a bit of electromagnetic pollution each day. Just using a microwave or shopping in stores with fluorescent lighting results in some exposure. What are some of the health risks of electromagnetic field radiation? There are a growing number of concerns. EMF has been linked with the disruption of bodily hormones such as melatonin and norepinephrine. EMF exposure can disrupt sleep patterns and contribute to anxiety and depression. It has also been linked with causing cancer in both children and adults. Some studies have even connected EMF with a heightened risk of Alzheimer's disease. Despite their name, the "positive ions" created by EMF are definitely not a positive thing when it comes to our bodily systems. At the very least, they contribute to lowered or inconsistent mood and energy levels. It is the negative ions we want more of, not the positive ones. The good news is that there are a number of things we can do for EMF protection and to increase our exposure to the rejuvenating negative ions that offset the effects of EMF. Negative ions are what you smell and feel after a rainfall or near a waterfall -- that clean, fresh-air effect that's so uplifting. They are also prevalent in areas with lots of trees and foliage as well as in direct sunlight. Getting out into nature is an easy and enjoyable way to offset the effects of EMF and increase your exposure to negative ions. Walking barefoot in the grass or being near the ocean or any other large body of water can have the same cleansing, healing effect. A hike in the woods can have a wonderful offsetting effect on the positive ions we encounter with technology use. But what can you do to offset EMF and positive ions while indoors? indoors is with Himalayan salt lamps. Many people are now discovering the rejuvenating health advantages of the Himalayan salt rock lamp. Himalayan salt crystal lamps are a great addition to your home or office. They are not only beautiful and soothing to look at; Himalayan salt crystal lamps also act as mood boosters and natural ionizer air purifiers, decreasing the amount of positive ions in the air caused by the technology we're exposed to every day.Himalayan salt lamps are made of real Himalayan salt, which has been proven to have a mood lifting and enhancing effect. Miners who work in the Himalayan salt mines are reported to be some of the most positive, mentally healthy people in the world. The reason? They get to work around the healing, ionizing energy of Himalayan salt all day long. Instead of feeling tired and depleted after a long day's work, many of them come home feeling uplifted and restored. Himalayan salt rock lamps provide natural EMF protection while also offering pleasant ambient lighting to any room or living space. 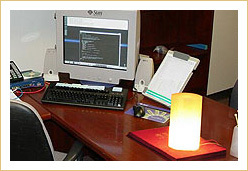 If you must stay indoors, a Himalayan salt rock lamp or two can help to neutralize the negative effects of computers or electronic equipment you use throughout your day. Pick up a Himalayan salt rock lamp or two for your home and your office.